In St. Mark’s Square pic nic is not allowed and by feeding the pigeons you can be fined. Gondola base price is 80 Euros for a standard tour of 30 minutes in day-time (up to 6 people on board), while the “traghetto” service by Gondola (from a side to the other of the Canal Grande) costs 2 Euros per person. Children can play in every “campo” (small square) in Venice: all the Venetian boys and girls use to play with balls, rollers, bycicles, kick scooters and to draw on the ground with colored chalks! “Venice, just like home“, advices and warnings if you are going to visit and stay in Venice. 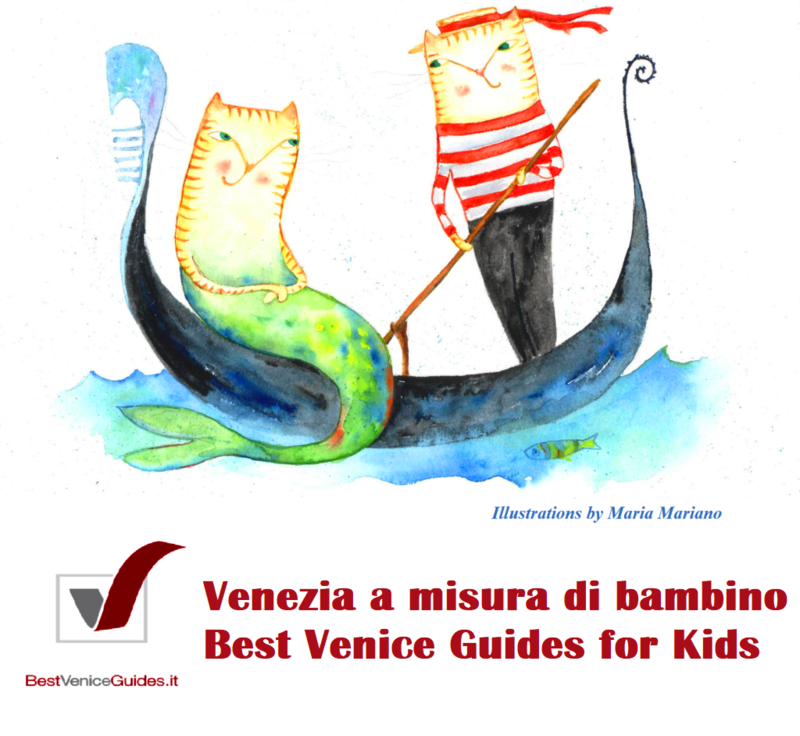 Venice Map for Children by Italy for Kids. Price: Euro 7,00. In Italian and English. 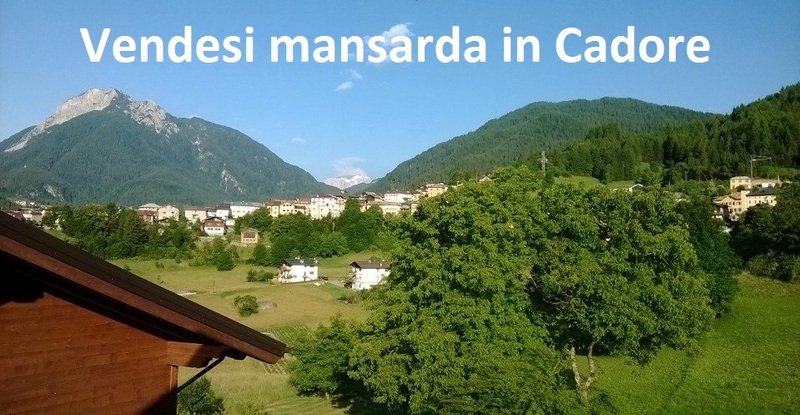 · a GONDOLA tour, even if a simple “traghetto” ride if you think they can be afraid to get on board. The so-called “traghetti” are short rides (a couple of minutes) between one side and the other one on the Canal Grande and they are still used by all the Venetian residents. We suggest you to take the “traghetto” in San Tomà/Sant’Angelo or the one in Rialto/Ca’ d’Oro. The standard touristic tour by Gondola lasts about 30 minutes and the price is 80 Euros (morning and afternoon, 100 Euros during night-time), while the “traghetto” has a lower price, just 2 Euros per person. An advice: before getting on board for a touristic ride, always ask about the price to the Gondolier. · A visit to the CAMPANILE, the bell tower, the so-called Paron de Casa (Owner of the House), in ST. MARK’S SQUARE. · A must picture with the LEONCINI, the two lions, in the Piazzetta San Marco, closed to the homonym Church. 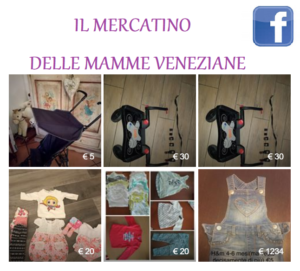 · The RIALTO MARKET, our fish and fruit Venetian market. 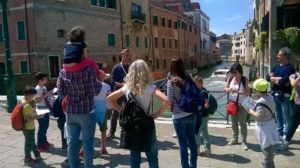 · A visit to the DOGE’S PALACE to discover the History of Venice. Available many activities so appreciated by children. · A visit to the PEGGY GUGGENHEIM, better on Sunday in the afternoon during the KIDS DAY, free activities for children 4-10 years old, and parents can enjoy the Museum. · A visit to the NATURAL HISTORY MUSEUM located in San Stae, with its new setting and multimedia activities so appreciated by children. 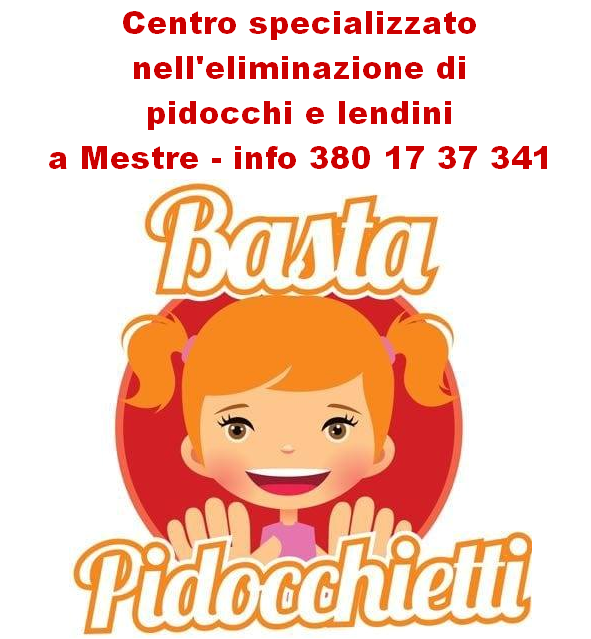 Kids lab are available. · A visit to the stunning staircase SCALA DEL BOVOLO, 5 minutes far from St . Mark’s Square. · A visit to the Goldoni Theather or the La Fenice Theather. · Painting a mask – handcrafts workshop. · If you are looking for some relax or beach time, we suggest you the VENICE LIDO BEACH, just 15 minutes far from Piazza San Marco. The island is worldwide well known for the International Film Festival taking place every year in September. Not everybody knows that … Venice has got its own Beach !! And also in Winter time this beach shows its fascinating side ! Children and kids love playing in the beach, with sand and water, so mum and dad can enjoy some relax time under the sun. Looking for what do to in Venice when you are here? Check out the day-by-day events’ calendar, the only one in Town with a 24/24 and 7/7 updating !! 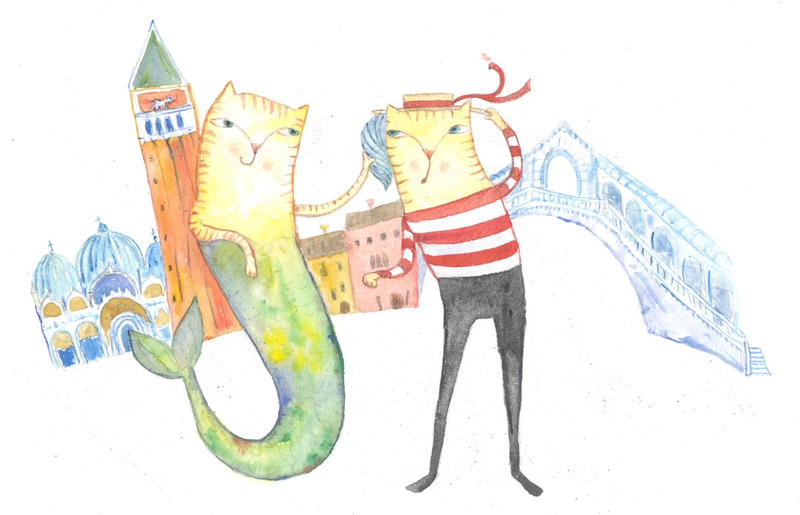 All the Family Friendly events are on VeneziadeiBambini ! Treasure hunts, private visits, walking tours and much more. Free consultation and quotation by clicking here. The treasures of Venice. Pop-up book. · Papadopoli Garden, closed to Piazzale Roma. · Sant’Elena, closed to the ACTV pier. · Savorgnan Park, closed to Guglie’s Bridge. · Villa Groggia’s Park in Sant’Alvise (in the complex you find also the Playroom “La Cicala e la Formica”). · In the garden of Ca’ Rezzonico there is a small playground: should be nice for a rest if you are nearby. Last update: June 26th 2018.